One of my favorite television personalities is Mike Holmes. A contractor from Canada, Mike has been the star of several renovation series, including Holmes on Holmes, Holmes Inspections and Holmes Makes It Right. He’s most famous for uncovering shoddy work by other contractors, tearing it out, and then completing the construction correctly. I feel the same way about most US Postal Service (USPS) regulations – they’re the minimum standards for mailers to meet. If you want to have your mail accepted by the USPS, then you must follow the regulations. But to be successful, you need to do more than just meet the standard. This is especially true when it comes to addresses. The address is the keystone for every mailing. All the work on design, print and processing won’t be noticed if the mailpiece isn’t delivered to the intended recipient. And the only way to get the mailpiece delivered is to have the correct address in the correct format. The two most important address standards are the Coding Accuracy Support System (CASS) and Move Update requirements. For discounted mail, each address and associated 5-digit ZIP Code on the mailpieces in a mailing must be verified and corrected within 12 months before the mailing date with one of the USPS-approved methods. Move Update, the process for updating names and addresses, must take place within 95 days of any discounted mailings. Running your mailing list through CASS software once a year, or using a Move Update process once a quarter isn’t enough. The best mailers recognize the need to do more than just the minimum, and have professional programs to maintain and update their customers’ addresses. The company uses a continual process that uses every interaction, every mailpiece and every available tool to make sure they have the correct address in the correct format for every customer. 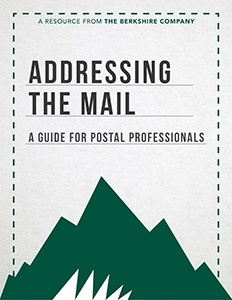 Based on our experiences of working with over 75 companies in the last 16 years, The Berkshire Company has put together a new eBook – Addressing the Mail: A Guide for Postal Professionals. In this guide, we discuss the different elements, tools and processes that help a company produce a document with the correct address, so that the document goes into the correct envelope, and the mailpiece is delivered by the USPS at the correct time. We also review how to process return mail, plus the hidden costs of poor address management. To download your free copy, please click the link below.